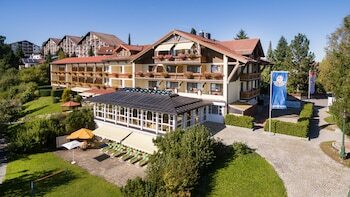 When you stay at Parkhotel Tannenhof in Oy-Mittelberg, you'll be 10 minutes by car from Alpspitzbahn Gondola. Featured amenities include a computer station, express check-in, and complimentary newspapers in the lobby. A train station pick-up service is provided at no charge, and free self parking is available onsite. With a stay at Comfort Hotel Atlantic Muenchen Sued in Ottobrunn (Upper Bavaria), you'll be 8.5 mi (13.7 km) from Marienplatz and 10 mi (16.1 km) from English Garden.